Active Release Technique® is a patented, state of the art soft tissue system/movement based technique that treats problems with muscles, tendons, ligaments, fascia and nerves. Headaches, back pain, carpal tunnel syndrome, shin splints, shoulder pain, sciatica, plantar fasciitis, knee problems, and tennis elbow are just a few common conditions that can be resolved quickly and permanently with ART. These conditions all have one thing in common: they are often a result of overused muscles. Each of these factors can cause your body to produce tough, dense scar tissue in the affected area. This scar tissue binds up and ties down the tissue in the area that needs to move more freely. As the scar tissue builds up, the muscles become shorter and weaker, tension on the tendons begin to build up causing tendonitis, and nerves become trapped. This can cause reduced range of motion, loss of strength, and pain. Every ART session is actually a combination of examination and treatment. The ART provider uses their hands to evaluate the texture, tightness and movement of muscles, fascia, tendons, ligaments and nerves. Abnormal tissues are treated by combining precisely directed tension with very specific patient movements. 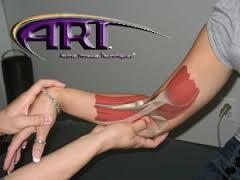 These treatment protocols (over 500 specific moves) are unique to ART. They allow providers to identify and correct the specific problems that are affecting each individual patient. ART is individualized to the patient's specific needs.